Jewish weddings in Melbourne are filled with symbolism and heritage. To make your event extra special, Weddings of Distinction is specially prepared to fulfill all Jewish wedding decoration requirements. If you’ve already found the right venue your next worry will be hiring a chuppah that reflects the decor or style your envisioning. 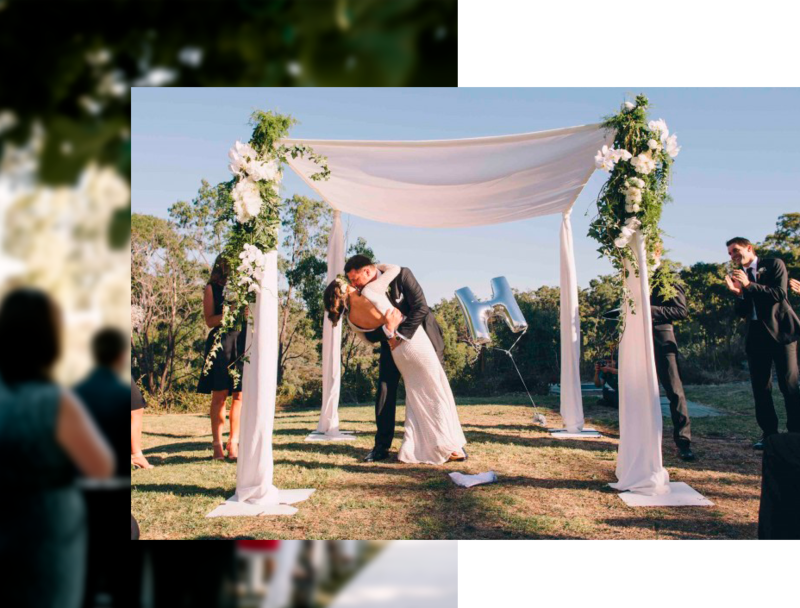 Since the chuppah is a symbol of the home that the couple will build together, we will discuss the details of its decoration to ensure that it meets your personal style. We are also able to arrange flowers that will complement your chuppah and ceremony décor in your choice of wedding colours. We offer tailored packages and many different chuppahs for hire in Melbourne that will fit into all couples’ budgets. Don’t forget that as Melbourne wedding decoration specialists, you also get to choose from hundreds of other matching wedding ceremony and reception decorations such as chairs, centrepieces and more. Take a look at our ceremony Look Book for examples of our previous events. Remember as part of our services, we supply same day delivery, set-up and pickup and ensure that your venue will look beautiful and organised.